Bracelet Jewelry Case are intended for the purpose of displaying all kinds of bracelets. They can be found available in a wide range of design and pattern so as to suit the interior decorations of your store. Moreover, there are also plenty of sizes and shapes, so you will be able to store and display all sorts of bracelets and wrist jewelry without a problem. Bracelet jewelry case are a definite must have in any jewelry store, they will prove to be a very useful and also beautiful and enticing item of jewelry display and your bracelets will be presented with grace and style. Depending on their size, they will also be very easily placed pretty much everywhere, but they are a great addition and a nice defining touch for all jewelry store’s window displays. They are lovely and they aim to exhibit any bracelet in a truly gorgeous manner! Necklace Jewelry Case’s main target is, obviously, to beautifully display various types of necklaces. Their sizes vary in order to fit all sorts of necklaces, from small and simple necklaces to large and intricate designs. Necklace jewelry cases offer diverse patterns and designs, colors and shapes so as to provide a more interesting, attractive and one of a kind presentation of your beautiful products. Given their less prominent size, however, they will be more easily accommodated everywhere in your store; you will be able to place those necklace jewelry cases on any counter, desk, vanity and so on. Naturally, they will look just fine and very attractive in the window display as well. This kind of jewelry case can be found available in various styles, from retro, vintage or antique like, to futuristic, minimalistic or modern designs. They are all meant to embellish your store and also to provide a better look at your products. Watch Jewelry Case aim at providing a beautiful display of your watch products and a safe storing at the same time as well! This kind of case is usually equipped with plenty of watch pillows that are soft, velvety and anti-scratch, therefore protecting your products. They come in various sizes but they are generally able to store plenty of watches. Some watch jewelry cases have also got a see through display lid that will allow customers to take a peek at the products displayed even when the lid is closed. This type of jewelry case is perfect for both watch stores or jewelry stores; they can be easily display in the window case of the store or on every counter around the store. Watch jewelry cases are beautifully designed products that offer a certain aura of elegance and grace and they are surely a must have in any jewelry store! Earring Jewelry Cases are a lovely, delicate and delightful way of presenting all kinds of pairs of earrings. They can display a wide variety of earrings, from ear studs to larger and more intricate pairs of earrings. Depending on each earring set, they come in various sizes but they are usually small so they will not take up any space whatsoever. They are usually petite square or rectangular boxes and they are available in a multitude of colors. Earring jewelry cases are a small yet highly significant item of jewelry display and any jewelry store should go for them. They can be integrated in any jewelry exhibition set. They are dainty, cute and stylish. Earring jewelry cases are by far the best idea to embellish your jewelry store and to shed a more elegant and graceful light upon your environment. They are a very important item of display and they will present each earring with class and style! Travel or Storage Jewelry Case are by far the most efficient and elegant method of both displaying various items of jewelry and keeping them safe as well. Travel jewelry cases offer a very convenient and useful way of transporting any collection of jewelry everywhere with you with no effort whatsoever. They are designed so as to accommodate all kinds of jewelry, from rings and earrings to necklaces, bracelets, watches and so on. 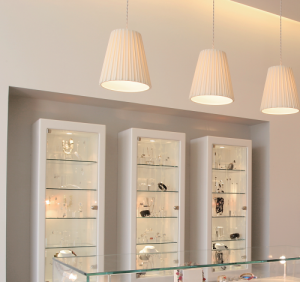 While their main target is to store jewelry items, they will also daintily display them before any customer as well. They can be placed everywhere in the jewelry store to present all sorts of jewelry in a beautiful and graceful way. They are meant to help transporting jewelry much easier and also facilitate storing and keeping them safe as well. They are available in diverse kinds of designs, styles, from gorgeous vintage designs to modern and many more! Ring Jewelry Cases are small yet very important display cases. They are usually square shaped and small sized, yet they come in a variety of colors and designs. They are often further secured by a lid so that each ring is safely stored as well. Moreover, thanks to their reduced size, they will be accommodated anywhere with ease and they will provide a lovely and elegant touch in any exhibition set or decoration. In addition to all that, not only are they perfect for the display of rings, but they are also the most customary manner of storing engagement rings until the big question is asked! 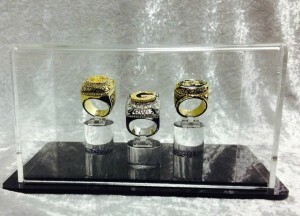 Ring jewelry cases are undoubtedly a highly significant type of display that no jewelry store should come short of! They are amazing for the display of entire collections of rings or they can be used to present them individually everywhere around your store just as well! 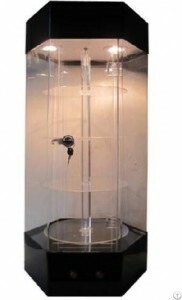 Jewelry magnetic towers are an interesting and attractive manner of displaying various items of jewelry. They are equipped with special magnetic bars that can be removed in order to suit your needs and preferences. They are available in all shapes, colors, sizes and designs. Given their nature, they are a perfect addition to any steampunk-ish or futuristic themed jewelry store, but they are just as suitable for normal and non specific jewelry stores. Depending on their size, they are also very fit for the display of jewelry in the window. This type of jewelry display is able to accommodate any kind of jewelry from smaller items such as rings and earrings to larger one, tiaras, belts, necklaces and so on. Their magnets also offer a certain kind of originality and appeal. They provide an attractive, innovative and entertaining display of jewelry products and they will certainly be very much admired. 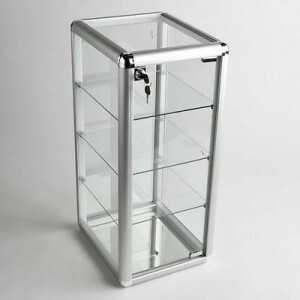 Lockable Jewelry Display Cases are undoubtedly the safest and most surest way of presenting items of jewelry and also keeping them safely stored and far from any prying hands. They can be glass top cases, jewelry boxes, table tops or towers and they are all secured with a sturdy and reliable lock that can be unlocked with a special combination of your choice. They are stylish and elegant and they also offer a sense of certainty and safety to your products and, in consequence, to your store. They are the way to go if you want to offer a safer display of your items. They are intended for general use so you will be able to present plenty of jewelry types this way. Lockable Jewelry Display Cases are the perfect choice should you feel the need to ensure your products more and they will also offer a certain kind of elegance to your items as well! Portable Jewelry Display Cases are a great and very efficient way of both displaying and also storing all sorts of jewelry products. They are very useful and they provide an elegant and chic display of your items. They can store all kinds of jewelry, from small ones to larger ones. They also come in a variety of styles, designs, shapes, sizes and colors as well. 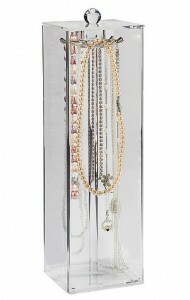 Portable jewelry display cases can be accommodated in any jewelry store’s window case or everywhere around the store. In addition to the beautiful display, they will prove to be very useful whenever you need to transport your products. They provide a very efficient and helpful way of storing, organizing and transporting any kind of jewelry item, therefore making them very convenient to have around the store. They are multipurpose and they will surely prove to be very a very satisfying manner of jewelry display and storage. 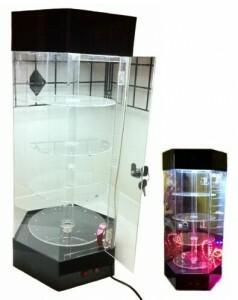 Lighted Jewelry Cases provide a fabulous and elegant of having various jewelry products displayed. If you would like to present your jewelry before your customers like a true work of art, light jewelry cases are definitely the answer! They come in many shapes, sizes and designs: they can be small jewelry boxes for rings or they can be bigger cases that are able to accommodate larger items of jewelry. Regardless of that, they will display any type of jewelry from rings, brooches to bracelets, necklaces and so on. The color of the light varies as well so you can pick all sorts of shades to shine upon your products. Lighted Jewelry Cases are definitely ideal for the display of jewelry in window cases as they can clearly exhibit your jewelry day and night without an effort. They are shiny, exquisite and they offer an enticing manner of displaying items of jewelry. Stackable Jewelry Cases are a highly efficient and space and time-saving method of having your items of jewelry displayed. They are usually square or rectangular boxes that are divided in a rather larger number of smaller slots where you can easily store and display all sorts of jewelry. There are usually more stackable shelves to each case and they are interlocked with each other. They provide an interesting design and they can readily present all the jewelry that is displayed on each level. Stackable Jewelry Cases come in various sizes in order to accommodate more kinds of jewelry, though they are more suitable for smaller pieces such as rings, pairs of earrings, bracelets, brooches, ear studs and so on. They are very useful and convenient as they can store and exhibit a rather significant number of jewelry with ease. You can stack your jewelry therein with no problems and they are also very easy to transport as well. Rotating Jewelry Cases are a fun and interesting way of presenting your products in the window display case or everywhere throughout your store as well. They vary in style, shape or design but generally they are round or oval shaped for a better view. They are mostly equipped with many levels so you can readily accommodate plenty of jewelry. They are usually completely transparent and they can rotate at all given times. Their rotating ability offers a definitely better and more accurate look at your jewelry products so they will display any kinds of items in an efficient and attractive manner! They are undoubtedly ideal for being displayed in the window of your store so that any passer by can admire your products! Rotating jewelry cases an innovative, stylish, trendy and definitely interesting way of having your jewelry exhibited and it will surely prove to be very efficient and satisfying as well! Mirrored Jewelry Cases are a gorgeous and exquisite way of displaying jewelry. Their main target is to present items of jewelry and beautifully reflect them as well. They often come in very diverse shapes and designs, but they are usually geometrically shaped (such as pyramid shapes, square shaped and so on). The bottom of the case is mainly the mirrored part of these cases but there are cases that have reflective sides as well. They can be arranged in multiple shelves or just on one level. This kind of jewelry case offers a lovely and an enticing manner of presenting all sorts of jewelry. Their reflective qualities will prove to be very attractive and they will beautifully display all angles and sides of each jewelry piece for a better and more accurate look. Mirrored Jewelry Cases are usually small or medium sizes, therefore making them easy to place pretty much everywhere! Wall Mounted Display Cases are truly gorgeous and fabulous display products. They offer a wide range of jewelry display and they can store plenty of any kind of jewelry item. They are usually very elegant and they are intelligently organized in order to provide a smart and efficient display and storing of your products. Many wall mounted display cases are also equipped with variously sized mirror for even more convenience. They can readily accommodate large numbers of jewelry pieces without a problem. They are usually black colored for even more elegance and grace but you can find them available in plenty other colors as well. This kind of jewelry display case is a genuine piece of art on its own and they will definitely display all of your jewelry products in a fabulous and astounding manner. They are attractive, space efficient and beautifully designed jewelry cases that will surely exhibit your items in a lovely and enticing way. Hanging Jewelry Cases are a stylish, interesting and DYI kind of jewelry display. They provide an efficient and definitely space-saving way of exhibiting plenty of jewelry items. They are usually made of thick and resistant fabric. They feature a large number of pockets and they are generally dual sided so they can display even more items of jewelry. The pockets are entirely see through for a better display of your products. Hanging Jewelry Cases are very useful and convenient as they can be hanged against any door knob, cabinet door, wall, closet door or any other kind of vertical surface. They display a great number of jewelry items in the same place and they don’t take up any space whatsoever. They are mainly suitable for smaller pieces of jewerly, such as brooches, pairs of earrings and even bracelets. They are ideal if you intend to go for a more handmade and crafty look in your store. Adjustable Shelving Jewelry cases can refer to any kind of case that is equipped with arrangeable shelves. They usually are rectangular or square shaped boxes with a various number of shelves. They are also generally transparent for a more efficient display of jewelry. The adjustable shelves are highly convenient whenever you intend to display larger and more prominent items of jewelry that need more space in order to be accommodated. They can help you save up a lot of space and they are definitely perfect for the display of jewelry in any jewelry store’s window case. They are very useful and they can efficiently store and beautifully present all sorts of jewelry products with no effort. They also come in diverse designs in order to offer a more attractive and entertaining presentation of your products. 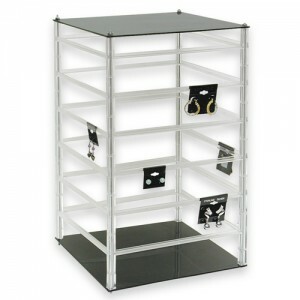 Adjustable Shelving Jewelry cases are a helpful, efficient and elegant manner of jewelry display as well.